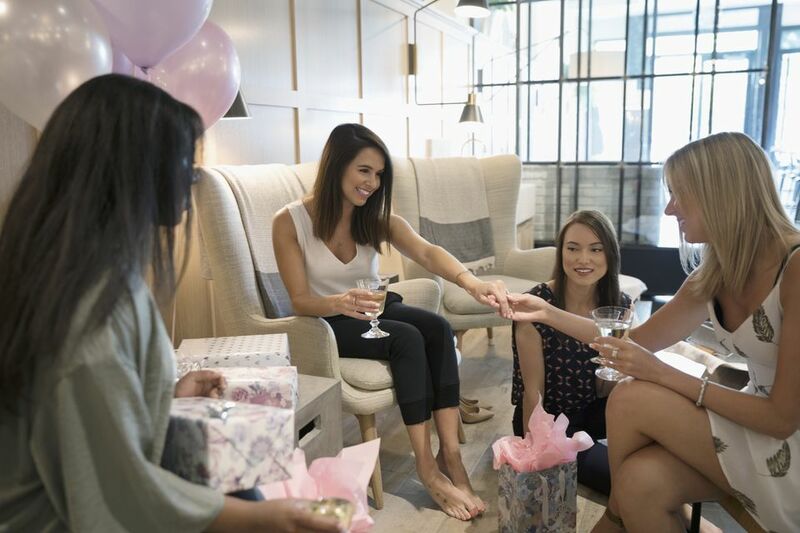 A bridal shower is a happy occasion, celebrating the future of the bride-to-be. Friends and loved ones gather to share their wishes, advice and give gifts to the bride and her future husband, who may or may not be present. Traditionally these gifts were intended to help the couple start their new home with all of the basic necessities of a household. In recent years, since so many couples have already moved from their parents’ homes, showers often have themes that are a little more specific than a general household shower. Themed showers can inspire games, decorations, and cakes specifically tailored to the theme. Naturally, if you’re responsible for planning this party you’ll think of all the things you can do to make the bride feel loved. But why not let the guests take home a memory of those good feelings by sending them off with a small party favor that will remind them of the day? You can let the theme of your shower inspire the perfect favor for the occasion. There are some items that are classic favorites for party favors, and any of them can be adapted to one of the themes below. These include cake pops; cupcakes; personalized chocolates; picture frames. You can find any and all of these online or in local bakeries and stores. If you purchase them from a local supplier, you can easily find decorative favor boxes or pouches in craft stores that can be used to create a pretty wrapper for your favors. If you’re hosting a traditional, general household bridal shower, the symbols for this theme, which will become integrated throughout your party plan, are generally romantic and may include bride and groom figures, bells, wedding cakes, hearts, and doves. Choose boxes, curious, or sweets that represent those symbols. Or, to remind your guests of the classic bride necessities, give them “something blue” such as a candle, soap, or blue frosted treat. A bridal shower tea party is definitely a classic theme for a general shower. But you can customize your party favors with tea-themed items such as: infuser; tea bags; tea cookies; tea bag caddy. This shower theme has become popular in recent years. The bride and her bridal party get together for a day of pampering. This can be done in someone’s home, but more commonly the bridal party treats the bride to a day at the spa. Favors for the guests might include: slippers; bath salts; soaps; candles; a manicure set. For the bride who has everything for the home, a lingerie shower treats her to everything she might want for the more personal side of her marriage. Keeping the shower favors personal, as well, they might include: lip balm; body lotion; perfume bottle. If the bride loves the beach, a beach themed shower is perfect for her, setting her up with gifts she can use on her favorite outing. This can be hosted, literally, like a beach party when the weather is good, or with beach themed decorations in someone’s home. Perfect party favors might be: sunscreen; beach ball; beach towel. This shower is designed to give the couple everything they need for easy travels on their honeymoon. Party favors for guests at this shower might include: toiletry bags; luggage tags; hand sanitizer. This shower theme is close to the traditional household shower but focuses on kitchen items. Party favors at this theme shower could ​include: refrigerator magnets; shopping list pads; mini cheese graters. As we’ve become more conscious of the limited resources of our planet, many households are changing their habits to live in a more environmentally friendly way. This shower gives the bride and groom household items that help to live a greener life. For guests, these party favors would support this theme: reusable tote bag; potted herbs; small nests with candy-coated Jordan almonds that look like eggs. For the couple that enjoys a good cocktail party, this shower theme is for gifting items that will help them host future events. Party favors for guests could include: bottle stoppers; mini champagne bottles; martini glasses filled with chocolates or candied nuts; wine charms.